Adenoid cystic carcinoma (ACC) is a rare tumor, described as being one of the most biologically destructive tumors of the head and neck. It is the most common malignancy that affects the minor salivary glands. Lung and bones are the most common regions of ACC distant metastasis. To the best of our knowledge, herein, we report the first ever case of latent isolated sternal metastasis from ACC in a 52-year-old gentleman, who was diagnosed to have ACC of the submandibular gland, excised 10 years ago. A denoid cystic carcinoma (ACC) is a rare tumor. Although ACC accounts for 10-15% of all neoplasms of the salivary glands, it is the most common malignancy that occurs in the minor salivary glands. 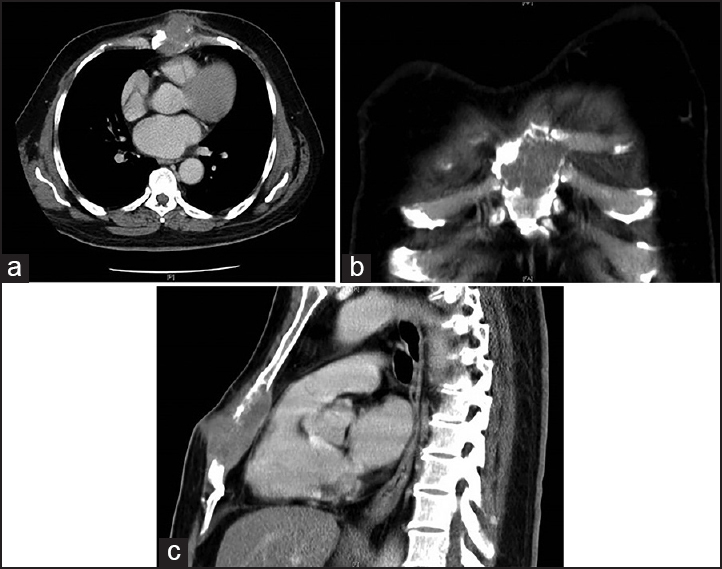 Herein, we report, what we believe is the first case of the latent isolated sternal metastasis from ACC in a 52-year-old gentleman, who was diagnosed to have ACC of the submandibular gland, excised 10 years ago. A 52-year-old gentleman presented to thoracic surgery clinic with a 4-week history of symptomatic swelling over the sternum. Past medical and surgical history was remarkable for ACC of the submandibular gland status postresection of 10 years ago. Physical examination showed a 4 cm × 5 cm, soft, tender, and destructive mass over the lower sternum. A laboratory workup was unremarkable. An incisional biopsy was done and showed features suggestive of metastatic ACC. Contrast-enhanced computed tomography showed a 4.1 cm × 2.6 cm × 5.5 cm, destructive, exophytic bony lesion (of soft tissue density) over the lower sternum with involvement of the costo-chondral junction of the fourth and fifth ribs on the left side [Figure 1]a,[Figure 1]b,[Figure]c. The whole-body positron emission tomography scan did not reveal similar lesions elsewhere. So, the decision was to proceed with surgery. Intraoperatively, the tumor was arising from the upper sternum and invading part of the pectoralis major fibers. The complete excision was done for the lesion in the form of partial sternectomy, and the defect was covered with Gore-Tex mesh and flaps with pectoralis muscle. 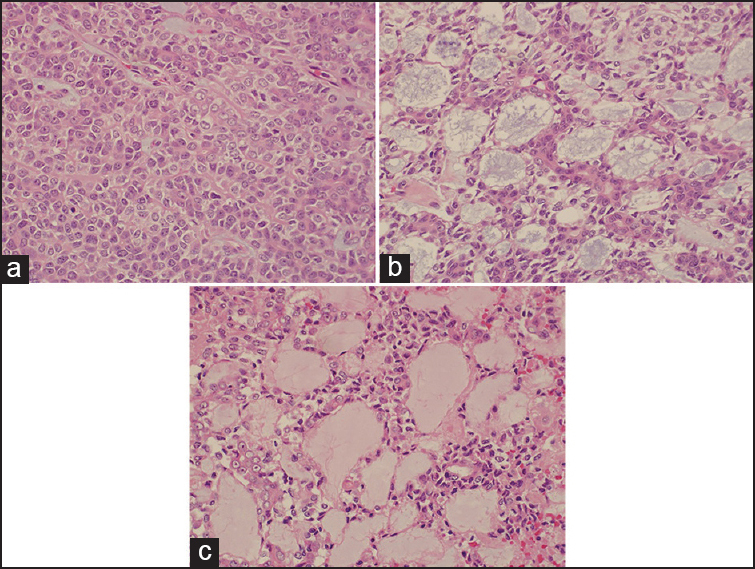 Histopathological studies showed a predominantly cribriform pattern, characterized by the nests of cells with uniformly round and hyperchromatic nuclei [Figure 2]a,[Figure 2]b,[Figure 2]c, consistent with metastatic ACC. Margins were negative. The patient had an uneventful postoperative course and was discharged home on day-5 postoperatively in a good condition. At 12-month postoperatively, the patient was asymptomatic without the radiological evidence of recurrence. ACC usually presents as a painless slow-growing mass in the face or mouth., On average the 10-year, overall survival rate for a patient diagnosed with ACC is 50%, especially if it metastasis to the lung. The case described in this report is unique in the fact that this patient suffered an uncommon metastasis to the sternum. Up to our knowledge, this is the first report to describe such a presentation of ACC. Generally, the sternum is a relatively uncommon site for any metastasis. Sternal metastasis, especially solitary lesions, usually develops secondary to lung and breast cancer. In regard to which part of the sternum is involved more with metastasis, older reports suggest that the manubrium tends to be more involved in comparison to other parts of the sternum. More recent, ones indicate that the body of the sternum is rather more involved. Pathological fractures with deformity and poor spontaneous self-healing have been reported as one of the complications associated with sternal metastasis, especially if the primary tumor was from the breast. Regarding the management, sternal metastasis resection and associated sternectomy should be considered as part of a multimodal treatment approach. This should include; surgery, radiotherapy, chemotherapy, and hormonal therapy depending on the size, type of the tumor, and its local and distant metastasis status. The use of prosthetics in the reconstruction of the sternum is a widely acceptable and effective practice if preformed properly in the patients with low risk of developing infections. Such materials include polypropylene and Gore-Tex, which have the advantage of being impermeable to air and fluids. Up to date, there is no definitive or agreed upon treatment protocols., This can be partially attributed to the rare nature of the tumor and the resulting lack in clinical trials on the different available treatment modalities., Having said that, the combination of surgical resection followed by radiotherapy are the common practice in treating ACC., Several reports have demonstrated favorable outcomes when this combined approach is applied in comparison to the surgery or radiotherapy alone., Long-term follow-up is important due to both the high recurrence and late metastasis tendencies, this tumor exhibits. In conclusion, up to our knowledge, this is the first case report of ACC with distant metastasis to the sternum. Furthermore, our experience shows that surgical resection is an effective treatment modality if such metastasis occurs. Moreover, the sternum should be considered as a potential site of metastasis for such tumor. Laurie SA, Ho AL, Fury MG, Sherman E, Pfister DG. Systemic therapy in the management of metastatic or locally recurrent adenoid cystic carcinoma of the salivary glands: A systematic review. Lancet Oncol 2011;12:815-24. Bradley PJ. Adenoid cystic carcinoma of the head and neck: A review. Curr Opin Otolaryngol Head Neck Surg 2004;12:127-32. Sung MW, Kim KH, Kim JW, Min YG, Seong WJ, Roh JL, et al. Clinicopathologic predictors and impact of distant metastasis from adenoid cystic carcinoma of the head and neck. Arch Otolaryngol Head Neck Surg 2003;129:1193-7. Rosenberg M, Castagno A, Nadal J, Rosales A, Pueyrredon EP, Patané AK. Sternal metastasis of breast cancer: Ex vivo hypothermia and reimplantation. Ann Thorac Surg 2011;91:584-6. Lequaglie C, Massone PB, Giudice G, Conti B. Gold standard for sternectomies and plastic reconstructions after resections for primary or secondary sternal neoplasms. Ann Surg Oncol 2002;9:472-9.